For teaching, I developed a method to explain quickly and unequivocally which keys should be played at what time. For this I chose five symbols to use for the pentatonic (five-tone) balafon. I deliberately opted for symbols and no notes so that the entire system can be used for every balafon. These are the following characters: /, ✱, Δ, O, X. The pentatonic series is recognizable on every piano. The black keys are an example of a pentatonic series; a group of three tones with a whole note in between, one and a half note followed by a group of two tones with a whole note in between. For the C # major tuning that I use for my balafons, it means C # = /, D # = ✱, F = Δ, G # = O and A # = X. In order to apply my study material and symbols script to balafons with a different tuning, you have to decide once how that tuning matches my symbol sequence. The first of the group of three tones has the / character. The pentatonic series can in principle start at twelve places (7 whole notes and 5 half notes). In the Table you can easily look up how the placement of the characters applies to other balafons. What symbols do I use for my balafon? In the notation, time runs from top to bottom. On each row you see all the tones of a complete balafon. The shaded boxes are played with the left hand, the delineated boxes with the right hand. Above each column the symbols for that column are shown again. The same characters were used in my Percussion Studio files that I developed for students. 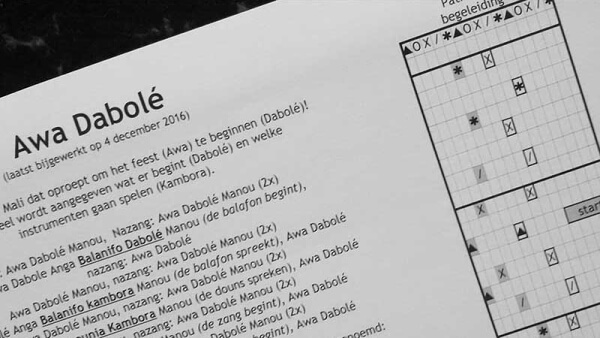 The instruments used are my recordings of my own balafon in C # -major, and therefore can not be used directly for other balafons. 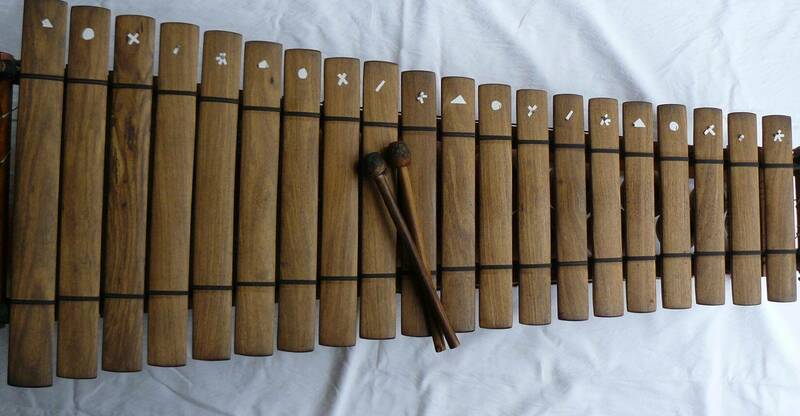 For this purpose, other Percussion Studio should be made with custom pentatonic tuning.